Be the first to share your favorite memory, photo or story of Marlys . This memorial page is dedicated for family, friends and future generations to celebrate the life of their loved one. 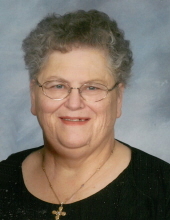 Marlys Buhr, 75, of Charles City, passed away Saturday, November 17, 2018 at the 11th Street Chautauqua Guest Home. A memorial service for Marlys Buhr will be held at 2:00 p.m. Wednesday, November 21, 2018 at the Gospel Lighthouse Church in Floyd with Pastor Paul Phillips officiating. Inurnment will be held at a later date. Gathering of family and friends will be one hour before the service at the church on Wednesday. Marlys Eileen Blunt, the daughter of Clyde and Leona (Smith) Blunt, was born on August 17, 1943 in New Hampton, Iowa. She graduated from high school in New Hampton. She was united in marriage to Ronald Buhr on June 5, 1964 at St. Paul’s Lutheran Church in Fredricksburg, Iowa. Marlys began working for the egg plant in New Hampton and then various establishments in the Charles City area. She was a member of 4-H when she was younger, Moose Lodge, Gospel Lighthouse Church, and Curves. She loved to play Bingo, bowl, dance, and travel. Marlys had a big loving heart and was always willing to help others. She will be deeply missed by all those who loved her. Living family members include her husband of 54 years, Ronald Buhr; children: Russell, Raymond, and Rhonda (Doug) Rosendahl; grandchildren: Kaitlyn and Emily Buhr, and Morgan and Brock Dvorak; brother, Garon (Barbara) Blunt; and nieces, nephews, and other family members. She was preceded in death by her parents, Clyde and Leona Blunt. To send flowers or a remembrance gift to the family of Marlys Buhr, please visit our Tribute Store. "Email Address" would like to share the life celebration of Marlys Buhr. Click on the "link" to go to share a favorite memory or leave a condolence message for the family.